Prabda Yoon won the prestigious SEA Write Award for Kwam Na Ja Pen (Probability) in 2002, but it’s only now that these stories have been translated into English for The Sad Part Was. 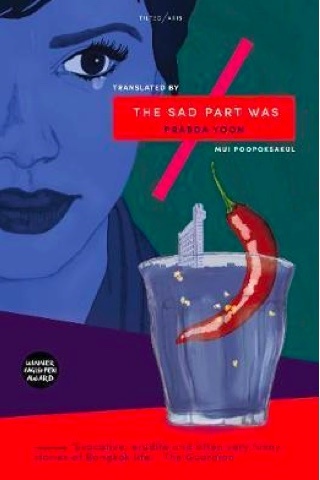 As his translator Mui Poopoksakul writes in a final note in the book, Prabda was “hailed as the voice of a new generation, of those Thais whose collective consciousness is tied to the experience of growing up in a fast-urbanising country”. It helps to keep in mind that these stories had their genesis in the late 1990s, when post-modernism first fused with traditional Thai literary thought. This might help the reader forgive the fact that some of the stories do feel somewhat dated—the author inserting himself into the story via a cranky protagonist feels very much of the just-discovering-post-modernism era. While we can appreciate the stories’ historical importance, occurring as they did at a crucial juncture in Thai literature, we didn’t fall in love with this collection in a heart-and-soul sort of way. The sometimes absurdist prose feels like it’s written simply for the sake of being absurd, rather than having an ultimate overarching objective in each story. One story that broke through this artifice and felt haunting in the way we like short stories to be though was “Snow for Mother”, when a mother takes her ill son to Alaska so he can see snow for the first time, hoping it will cure him; she realises something else instead. We also dropped right into the story about a commuter noticing a fellow commuter write with significant space between her sentences, interesting partly because Thai words have no spaces between their words; we couldn’t quite parse the larger meaning, though. (This sentence construction proves challenging for Prabda’s translator, as this allows for a certain kind of word play that becomes difficult to follow through into English). Thailand as a setting seems to be incidental to these stories, and it’s to their advantage, really. There’s the story of a vampire in Pattaya, but Pattaya doesn’t jump off the page in a way any different to other descriptions of the seedy beach resort town elsewhere in literature. A tall Bangkok building is described as “phallic”; Lumpini Park is simply where a lot of people exercise; commuter buses are crowded. It doesn’t seem to be Prabda’s mission to render Thailand in a way that is notable, perhaps a statement in itself that's critical of the flowery descriptions of times past. Instead sometimes something particularly Thai forms the centrepoint of a story, such as bird’s eye chillies in “The Crying Parties”, or a fishing boat in "Found". Subtle societal descriptions are more revealing; an art student spends four years studying but fails to come up with all-important (but meaningless) “concepts”; a schoolgirl believes one and one do not equal two (a commentary on how non-conformity is viewed within Thai society); a TV host desperately strings out an interview hoping a Western traveller will reveal a secret he uncovered in a forest in Thailand’s south. We liked these stories much more when we looked back at them as a collection than when we considered them individually, which perhaps says something for the collection form. Read these for a teasing flavour of an urbanising Thailand and her shifting society in the late 1990s.